Understanding some of the perils of buying a bike off the Internet instead of at your local bike shop. Caveat Emptor! You know that moment when you think, I need to buy a… and before you finish your thought, the internet bombards you with ads for the very item that, seconds prior, was a mere spark? The internet is filled with fun things to buy that you can’t get anywhere else, but bikes shouldn’t be one of them. Here’s why. Bike sizing is varied and can be confusing, especially for new buyers. They come in small, medium, and large. They come in centimeters. They come in inches. The size you need in one type of bike might be different from the size you need in another. Size charts will get you to a good approximation based on your height, but riding a bike (or several) is the only way to truly know what fits you best. If you’ve ever ridden a bike that felt awkward, uncomfortable, or downright unwieldy, you may have been on the wrong size. We can help you find the right fit for your height and the rest of you so you enjoy the last mile of your ride as much as the first. We’ve all done it. You see that great-looking sweater for an impossibly low price and you can’t resist hitting “add to cart.” Then it arrives. Cheap fabric, weird sizing, in a color that doesn’t quite match what you thought your ordered. Unless you’ve been around a lot of bikes, it might be harder to recognize a cheap one when you see it, but an internet bike’s frame is probably made of a low-quality metal. 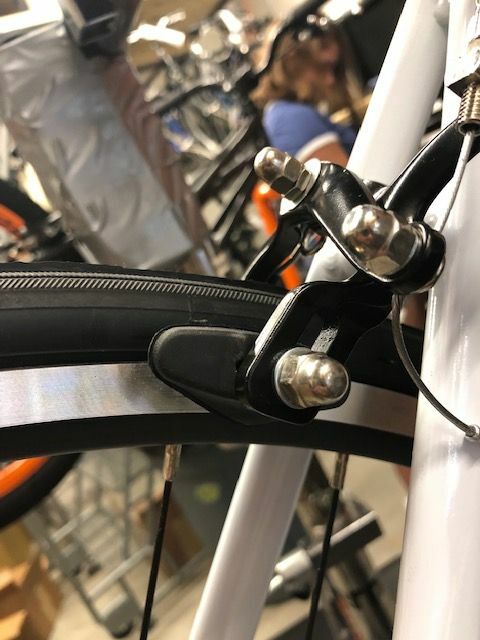 To create low-cost bikes, manufacturers also use mismatched components that aren’t designed to work together, like brakes that grab the tire instead of the wheel. This creates, at best, a bike with parts that will wear out in a season or two. At worst, a bike that’s unsafe for riding. Do you know the proper torque setting for tightening a headset cap? If you don’t know (and most of those words don’t make sense to you), you’re normal, but you also might not be ready to assemble your own bike at home. Even if it arrives mostly assembled, putting the remaining pieces together correctly is vital to the safe operation of your bike. While it may look easier than, say, the Liatorp Entertainment System or the Stuva Loft Bed from IKEA, getting all of the moving parts of a bike working in concert for a smooth, safe, comfortable ride requires years of experience. At-home assembly may also invalidate your bike’s warranty, so read the fine print. If you have to pay an extra $100+ to have your low-quality bike assembled professionally, are you really saving enough money to make it worth the risk? Then go test ride bikes! Test ride the ones you think you love, the ones you kind of like, and a few you’ve never heard of. Arrive at the shop armed with your information, but also be open to recommendations within your budget. It’s in our best interest to put you on the perfect bike because we want you to come back and to recommend us to your family and friends. Finally, you can also use the internet to post pictures of you and your new bike that will make all your friends Celeste green with envy! To find the safe, high-quality, perfectly assembled bike of your dreams, please visit Johnny Velo Bikes in Clintonville at 4231 N. High St, Columbus, Ohio, 43214. You can also give us a call at 614-333-0012.